With dining out getting more and more expensive, it's only natural that underground restaurants would come to the forefront. Tack on the impending HST and it's only a matter of time that there will be more of them. Tonight, I joined Jonathan, Drea, Anita, Victoria, Frank, Melody, Jessica & Mark and TS/JS for a dinner at a "secret" location. Steve of NFA (No Fixed Address) contacted Jonathan about a blogger's dinner at a reduced rate. Normally, the cost per person for a 6-course dinner (excluding beverages) would cost $50.00. Normally, one would contact Steve via email and a location would be setup for a private meal. The place we dined at tonight is best suited for 8 - 10 guests. We had 12 and it was a bit tight. The table was set up complete with the requisite flatware and wine glasses. Diners are responsible for their own beverages. 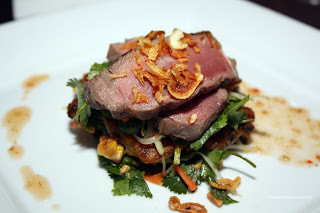 After a short while of chatting and mingling, we were presented with our appetizer - Thai Beef Salad. Steve put his own stamp on this by adding a sweet corn fritter on the bottom. The more standard items such as cilantro, mint, lemongrass, fish sauce and sweet chili sauce were all there and worked in perfect harmony. I liked the fried garlic chips on top. It added both aromatics and texture. But the star of this dish had to be the perfectly cooked beef. It was buttery tender and was the key component to this well balanced appetizer. Next up was the Trio of Scallops presented on a long platter. The first one was pan-seared with miso dressing topped by leek and apple. The scallop was perfectly seared. 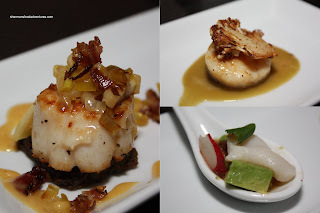 The combination of the miso and the sweetness of the apples really enhanced the scallop. We thought the best variation on the plate was the scallop with caper raisin emulsion. It was topped off by a piece of caramelized cauliflower reminiscent of Nuba. It was the perfect little bite that once again let the natural sweetness of the scallop shine. The last item on the plate was scallop ceviche with ginger, avocado and radish. It was pretty good with a nice zing. Next up was the Slow Cooked Fennel Pork Belly. This, apparently is NFA's signature dish and... it delivered. 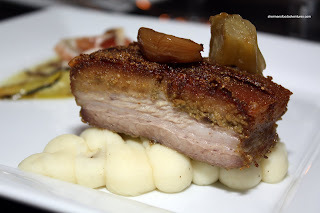 The piece of pork belly was cooked perfectly with tender flesh and sinfully delicious pork s kin. I particularly liked the gelatinous and fatty layer directly under the skin. It rested on a rather dry serving of mash potatoes; however, the roasted garlic on top made up for it. Served on the side was Serrano ham and endives drizzled with a thyme vinaigrette. 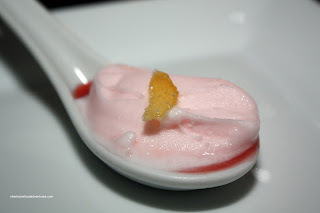 As a palate cleanser, we were served a spoon of Grapefruit Sorbet with Sliced Candied Ginger and Campari. This was a nice tart interlude before the next dish. Alright, I completely forgot to take a picture of the Sake Marinated Sablefish with Cantonese Vegetable Sauce because it looked strange. I thank Victoria for letting me use her picture (her fish also mushy like mine) Well, the piece of fish that I got was quite small compared to Mark's (his was perfect though) and it didn't look like sablefish. Rather, it beared a striking resemblance to pureed baby food. To be fair, we were informed that some pieces may have broken down due to the marinade and enzymes. Yet, I've never had a piece of sablefish with this type of texture before. Honestly, I didn't enjoy it. However, I did like the Chinese flavours of this dish. It was served on bak choy and topped with mui choy. Served on the side was a wonderful coconut cilantro sweet potato cake coated with panko. 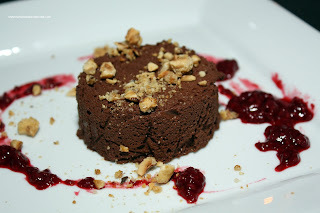 Finally, we were served a Dark Chocolate Mousse with Raspberry Coulis for dessert. Apparently, the mousse was prepared with no egg or cream, so that it would be lighter. I'm not so sure about that since it was still quite decadent. I particularly liked the hazelnut praline on top, it added a nice sweet crunch. I wasn't a huge fan of the coulis because it had seeds in it. It tasted fine; but I didn't like the texture. By this time, I was bursting at the seams. Even if I had paid the actual cost of $50.00, it would've been well worth it. 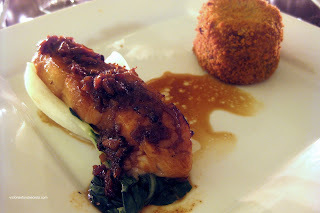 Most of the food was spot on (except for the sablefish) and definitely restaurant quality. I can definitely see this type of "restaurant" becoming more prevalent and popular. It serves as both a viable option and alternative to dining at a real B&M restaurant. I pretty much agree with all your comments. I hate seeds in my coulis too! But overall, nice room, good food, friendly chef, great company :) Until next time! Once again, it was a pleasure dining with you Mel! Glad to see I wasn't the only one picking on the seeds! Yes, until next time! Kim, I can't kill you... then you can't go eat with me anymore! it's my unobtainable dream to go to one of these hidden restaurants someday. i really need some good scallops and those look cooked to perfection. jealousy! Thanks Trisha. I'll learn to be mistake-free one day! LOL... Yah, the scallops were good! I learned about 12B @GourmetFury. Great stuff. No one should be touchy that a group of gourmets share a social evening and then split the bill. EnbM, keep commenting away. The more insight and knowledge, the better. You're right about the mui choy and pork belly! My dad's favourite dish, Cau Yook! Yah, the fish was marinated too long, it was mush. I think it affected some pieces more than others. Victoria and I got the smaller end pieces while Mark had a large mid-section cut which probably held up better to the sake. aww.. I missed this. The food looks delicious (drooling at the pork belly). Since Kim and a few other did not attend, maybe we can have another one. Jenny, we can have another one for sure! How about the "other" one? 12B? 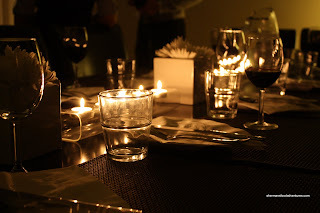 Just to let you know that the food looks awesome and I am a big fan of your blog!! You've been to many restaurants and the food you commented are great! It's going to be my bday soon and I'm really interested in the "NFA" Dinner place you went. If you don't mind, can you please let me know the info. I would love to go there or have them prepare a wonderful meal for me and my friends. Thanks for reading! You can have the meal at this "location" or they can prepare it at another too! sounds good, however I hear No. 12 is charging a 'donation' of $75/person now. Sounds a little pricey, don't you think? That is pricey. I'd pass on that if it costs that much! great post sherman, your photos are amazing!! Personally, I don't consider a palate cleanser as a course, so really, this is 5 courses @ $50. Actually, good point. I agree. Hey I'm very interested in dining here. But they haven't replied to my email. Do you know how long it took you to make a reservation. Thanks! @MFA Send him email from your work address if you have one - not a "generic" one (eg GMail, Yahoo, etc).